From May 20, and once the football season is over, FC Barcelona will be undertaking a series of changes to the Les Corts site to improve the facilities, some of which have become obsolete and need to adapted to current and future needs. The club will be spending some 10 million euros on the work that mainly affects the electrical installations and the South Goal tunnel. This work is prior to and unrelated to the Espai Barça, on which work is due to begin in the summer of 2019. The purpose is maintenance and safety to ensure that the stadium facilities function properly. The first job involves the electricity system (1). A new Endesa service drop will be fitted underground in the grandstand forecourt area, and will thereby optimise the electrical infrastructure to provide greater power in accordance with international standards. 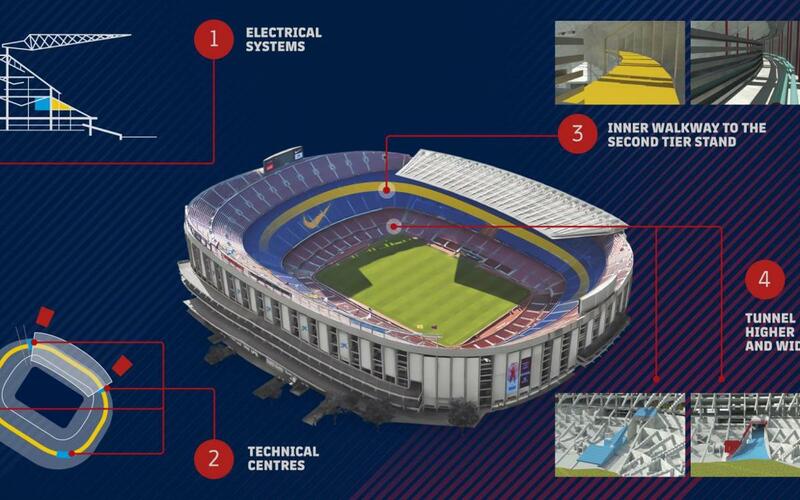 This will be connected to a panel called the 'release centre', which is connected in turn to four technical rooms at each corner of the stadium (2). The creation of these four points is the next job on the list. They will also be connected to the outer ring of the second tier, so the electricity supply will be able to serve whatever uses might be required. This will also help to optimise the system and make it more efficient because it incorporates the concept of 'centre of gravity'. A centralised supply of electricity to the stadium will imply less power loss during operation by bringing transformation points closer to the consumption points. As part of the procedure to improve the safety and continuity of the electricity supply, the generator sets will also be upgraded, which are only used in the case of a power cut. The third job is the creation of a large 360º inner ring at the height of the second tier (3). There is room in the grandstand to build what is a kind of inner highway, but it will need to be built for the rest of the stadium by moving some of the current uses and dismantling some of the stairways. This will create space to walk that will be separate from that used by spectators. The space will be used for cables for electricity, audio, fibre optics, megaphones, CCTV cameras, turnstiles, etc., and will only be used by qualified maintenance staff. The cabling will also be stored in tidy enclosures to assist with maintenance and safety work. The last job will be the expansion of the tunnel into the stadium (4). The Camp Nou only has one tunnel through which vehicles can get onto the pitch, the one in the southwest. What’s known as the ambulance tunnel can be accessed via Travessera de les Corts. This new tunnel will be wider and higher, thereby making it easier for emergency, maintenance and security vehicles to get to the pitch area. Grandstand forecourt zone. New underground Endesa service drop to optimise the electrical infrastructure and add extra power to the system in keeping with international standards. Four transformation centres. The release centre connects to four electricity rooms in the four corners, which are also connected to the inner ring, making for a more efficient electricity supply and less loss of power. An inner highway. A new walkway built out of reinforced concrete, separate from the spectator area. Orderly installations. Cables situated in trays to facilitate maintenance work. Removal of stairways. The modifications to the south goal entrance will be widened and raised so larger vehicles can get onto the field. Because of this work on the Camp Nou, the FC Barcelona Documentation and Studies Centre will temporarily close, and the staff working there will be moved to the Social Area. Due to this move, there shall be no visits in person and the service will only be operating via email to centre.documentacio@fcbarcelona.cat.